Bradford Teaching Hospitals NHS Foundation Trust is responsible for providing hospital services for the people of Bradford and communities across Yorkshire. We serve a core population of around 500,000 people and provide specialist services for some 1.1 million. 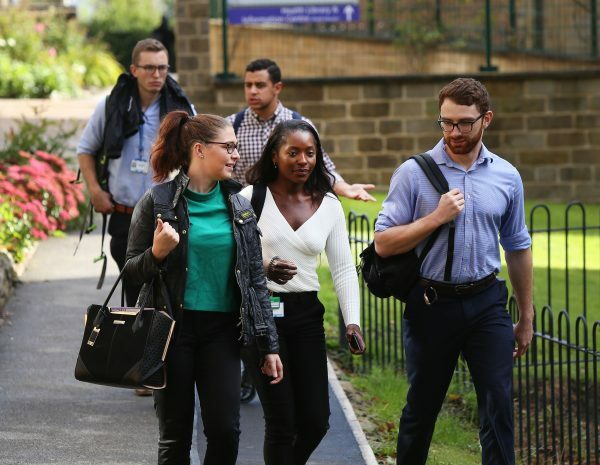 Our 5,500 staff work over several sites, including Bradford Royal Infirmary, which provides the majority of inpatient services, and St Luke’s Hospital, which predominantly provides outpatient and rehabilitation services. We also manage local community hospitals at Westwood Park, Westbourne Green, Shipley and Eccleshill. In 2017, we also completed a £2m refurbishment of our Accident and Emergency Department as part of an ambitious vision to create a more efficient acute medicine service for the people of Bradford. It has been designed to provide a slicker and more efficient service, with faster senior clinical involvement at an early stage in the patient pathway. One of our key strategic objectives is to ‘collaborate effectively with local and regional partners’. We are committed to doing this at a number of levels, both in Bradford and across the West Yorkshire and Harrogate region. The aim is that working together in this way will improve the care provided to patients and improve the health of people in Bradford and across West Yorkshire. Read more about how we work with our partners. The Freedom of Information Act 2000 (FOI) gives the public a general right of access to all types of recorded non-personal information held by public authorities, including the NHS. The Act sets out exemptions from that right and places a number of obligations on public authorities. We will deal with all requests in accordance with the Freedom of Information Act Code of Practice. Information about yourself, known as ‘personal data’, is exempt from disclosure under the Freedom of Information Act. It is the General Data Protection Regulation 2018 (GDPR) which gives you the right to see the personal information that we hold about you. Requests for personal data, including medical records can be made by contacting the Access to Records Team. Being a member of an NHS Foundation Trust means that you can have a real say, through your elected representatives (Governors), in shaping future services and strategic planning. You decide how involved you want to be – you may simply want to receive a newsletter about the Trust’s activities or you may want to stand for election to the Council of Governors, which works with the Board of Directors. Read more about becoming a member of our Foundation Trust. The Trust is committed to working with the media to ensure that our services and activities are accurately represented to wider audiences. Media enquiries between 8am and 5pm, Monday to Friday, should be addressed to our Communications Department. Call 01274 382265/383901. During out-of-hours (weekends, bank holidays and evenings) the on-call general manager should be contacted via the switchboard on 01274 542200. Volunteers are a vital part of the team at Bradford Teaching Hospitals, working across all of our sites. Our volunteers help us to achieve so much more – we simply could not operate as well as we do without them. There are currently more than 500 people who give their time freely to help patients, staff and visitors. On average, each volunteer donates four hours of their time each week – a total of 104,400 hours each year! We welcome volunteers from all abilities, backgrounds, cultures and beliefs. Volunteers provide an invaluable service through a variety of support services and activities and make a huge difference to the care that our patients receive. Find out more about volunteering at our hospitals. Bradford Teaching Hospitals NHS Foundation Trust is very proud to be the employment partner for Project SEARCH Bradford. Project SEARCH provides young people with learning difficulties the opportunity to gain work experience to increase their chance of securing meaningful paid employment. Since the first programme was launched at Cincinnati Children’s Hospital in 1996, the Project SEARCH model has expanded to more than 300 sites across the United States and the rest of the world. Bradford Project SEARCH is an annual programme. It provides three internships which offer students continual feedback on their performance and areas for learning and improvement. You can interact with Bradford Teaching Hospitals and various departments and services throughout the Trust on social media. Bradford Teaching Hospitals on Twitter: The main Twitter account for the Trust. All main communications are shared here. Your Voice: A Twitter account targeted specifically at patient and public engagement with the Trust. Bradford Teaching Hospitals’ Neonatal Service: The Twitter account for our Neonatal Service. Born in Bradford: The Twitter feed for the Born in Bradford project. Bradford Institute for Health Research: Tweets dedicated to ongoing research throughout Bradford. Following a review for the purpose of paragraph 2(b) of licence condition G6, the Directors of the Licensee are satisfied that, in the Financial Year most recently ended, the Licensee took all such precautions as were necessary in order to comply with the conditions of the licence, any requirements imposed on it under the NHS Acts and have had regard to the NHS Constitution. Signed on behalf of the board of directors, and, in the case of Foundation Trusts, having regard to the views of the governors. Please click here to view Bradford Teaching Hospitals’ constitution. 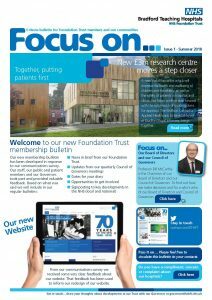 Welcome to our new Foundation Trust membership e-bulletin, Focus on…. Please click on the image on the right to view issue number one – Summer 2018.